I am delighted we now have this upper voice version of Colin Britt's exquisite setting of Millay's touching poem in my series. It requires a flexible tempo with plenty of gentle rubato to give the effect of a poem being spoken by an accomplished orator. Care should be taken to maintain excellent chordal balance however the voices are divided. 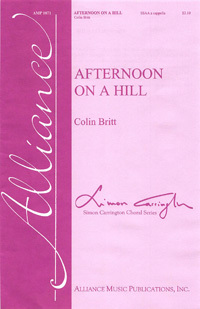 In measures 33-; 34 and 37-38 Colin's “small notes” make quite a difference to the texture; try and add them if you can! Be careful also not to allow too much of any one voice part where the parts combine again after having been divided.